On April 1st, 2011, Portugal's 10-year spread to Germany went above 5% for the first time. Two weeks later Portugal formalized its request for assistance from the EU/IMF. Yesterday, Spain's 10-year spread to Germany exceeded 5%. The chart below compares Spain's and Portugal's 10-year spread, aligning the charts at the point when the spreads first crossed the 5% level. 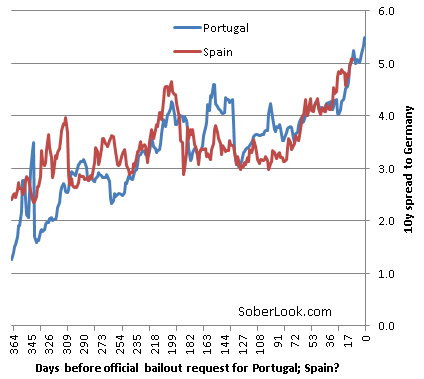 The x-axis is the number of days until Portugal's request for rescue funds, covering the full year prior to the event. If history is any indication - and these spread paths have been quite similar so far - there isn't much time left for Spain.